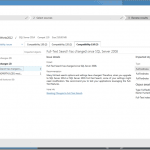 Today is the start of a new series of blog posts about upgrading and migrating to SQL Server 2016/2017 from an older version of SQL Server. It is also my birthday, so I figured it was a good time to start this series! For Day 1, lets talk about why you might want to go through the time, trouble, and expense of upgrading and migrating to SQL Server 2016 or SQL Server 2017. First, it is pretty likely that you have multiple older versions of SQL Server, running on multiple older versions of Windows Server, running on older hardware (whether it is bare metal or virtualized), using older, slower storage (by modern standards). Depending on how old your version of SQL Server is, it is probably out of mainstream or even extended support by now. That doesn’t mean that it suddenly stops working, but it does mean that there won’t be any more Service Packs or Cumulative Updates available. 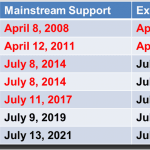 As I discussed here, SQL Server 2012 and older are all out of mainstream support (with SQL Server 2005 and older being out of extended support). Only SQL Server 2014 and SQL Server 2016 are still fully supported by Microsoft, and they have a wealth of useful new features that are not available in previous versions. This series is going to dive deeper into the why and how of making the case for an upgrade, and will cover useful tips for having a smooth migration process. I have a new Pluralsight course, SQL Server: Upgrading and Migrating to SQL Server 2016 has just been published. This is my eleventh course for Pluralsight, but the complete list of my courses is here. Building on this online course is a new three day class, IEUpgrade: Immersion Event on Upgrading SQL Server, taught by myself and Tim Radney. The first round of this course will be taught in Chicago from October 11-13, 2017. Finally, I will be presenting a half-day session called Migrating to SQL Server 2017 at the PASS Summit 2017 in Seattle, WA from October 31- November 3, 2017. Here is a link to the complete series about upgrading SQL Server.